Everything you need to know about the World Nomad Games in Kyrgyzstan – the last one happened in 2018! Dissecting lands that have transformed the shape of the modern world, the mountainous nation of Kyrgyzstan is steeped in centuries of history. UPDATE! If you’re wondering when and where the next World Nomad Games will be held, we have some news for you. According to reports from our insiders, the next World Nomad Games will be in Antalya, Turkey, in 2020. The Silk Road meandered through the peak-enveloped valleys and nomadic cultures thrived in the fertile lands. The empires of Ghengis Khan, Tamerlane and Alexander The Great wove their crusades across the plains, decimating villages as they went. Through Soviet empires the landlocked country was oppressed in bitter control, freedom was limited and democracy failed. The people of Kyrgyzstan have watched the sands of time blow across their beautiful land. Today the country is facing a brighter future and the people of Kyrgyzstan are excited to see what lies around the corner for them. But with prosperity and diversity on the horizon, no one has forgotten the importance of their culture and history. Want an epic Kyrgyzstan experience? Check out our adventure and photography tours happening in August 2019! Only a few places left. Join now! The World Nomad Games is a new event that has brought the personality of the Kyrgyz people to the forefront of the world’s media. Nomadic sports, intelligence games, displays of strength and pure showmanship are all showcased in a festival that has been dubbed the “Olympics for nomads”. In 2014 the first World Nomad Games was held in Cholpon Ata on the shores of Issyk Kul, the second largest saline lake in the world. Kyrgyzstan gathered the world’s attention and the success of the event was immense. Two years later the second World Nomad Games was held once again in Cholpon Ata, attracting 1200 competitors from over 62 nations and being broadcasted around the world to over 800 million viewers. From the 3rd to the 8th of September 2016 all eyes were on Kyrgyzstan, and we were among the lucky ones to be present. The sports were spread out over multiple venues. The horse events and wrestling being held at the main stadiums in Cholpon Ata, the cultural showcases, eagle and dog sports being at an ethno-village established in Kyrchyn Gorge and the intelligence games were located in other various hotels and resorts around Issyk Kul. Right from the Opening Ceremony, a spectacle attended by elite VIPs such as the president of Kyrgyzstan and Hollywood star Steven Seagal, it was obvious that nothing would be done in halves. Fireworks, horseback choreography, and insights into the local culture were displayed in impeccable performances. The crowd present were glued to their seats, enthralled with the festivities. The famous Turkmen horses and riders during the opening ceremony. The next few days unfolded in a series of heats all leading to the coveted finals in each discipline. While we mostly enjoyed the atmosphere at Kyrchyn Gorge, witnessing things like Kok Boru, Er Enish and wrestling in Cholpon Ata was a special memory. The cultural exhibits were colourful and captivating. The physical displays of skill and strength were simply mind blowing. Even the slower games such as Ordo managed to hold our attention for longer than we anticipated. For five days we bounced between the venues, constantly in awe at what the World Nomad Games represented – resilience and unity in a land of recent turmoil. The people we met were more than hospitable, welcoming us into their world with open arms. No matter where we went we were greeted with smiles and conversations. It really is the people that make Kyrgyzstan so amazing. The five days at the festival came and went incredibly fast, and we couldn’t believe it was over when we left. The closing ceremony, while not as exciting as the opening ceremony, left us wanting more. While Kyrgyzstan is more known for its cultural and historic heritage, the mountainous terrain and incredible trekking opportunities, the World Nomad Games helped it establish its reputation as the most progressive and exciting destination in Central Asia. Herding sheep during the opening ceremony of the cultural events in Jailoo Kyrchyn. 16 different types of sports and intelligence games are played at the World Nomad Games, and each of them is cherished deeply by the local people. There are 7 varieties of wrestling, including mas-wrestling, 6 involving horses, eagles or dogs and 3 intelligence games. Some are more spectacular to watch than others, but all are worth attending. Here is some information on some of our favourite sports. Kok Boru is by far the most outstanding and revered sport at the World Nomad Games. Similar to polo, this game involves two teams competing to throw an object into a round goal at each end of the field. The object: The headless carcass of a goat. Known as Buzkashi in Afghanistan (the national sport there), Kok Boru is also the most controversial due to the rough use of a dead animal. But this game has been played for centuries, and the goat is awarded to the winning team to be cooked up in a feast, so nothing goes to waste. Far and away Kok Boru is the most exciting sport there! Kyrgyzstan vs Kazakhstan in the finals of Kok Boru. While Kok Boru is the most exciting sport, Er Enish is the most brutal. This is essentially wrestling on horseback. Two warriors fight to throw the other off of their horse in impressive bouts of strength and agility. The skill needed to compete is insane, especially when considering just how tough it must be on man and horse alike. Warning: This is not one for the faint-hearted. Imagine javelin on horseback and you’ve got cirit! This Turkish sport has two teams battling each other, with points given for throwing long spears at your opponent. If you hit them or their horse you receive 4 points. If your opponent catches your javelin mid-throw they receive 3 points. Also known as traditional belt wrestling, Alysh is an exhilarating sport where players must throw their opponent onto the ground by grabbing a hold of the belt around their waist. There were actually quite a few different disciplines of wrestling at the World Nomad Games, and unless you were a fanatic or paid attention you could be forgiven for getting them mixed up. But it was well worth catching a few different matches. Salbuurun is actually made up of various hunting styles, rather than just one sport. Burkut Saluu is eagle hunting, where the bird of prey must track down and capture a target. Traditionally a live rabbit or fox, but at the World Nomad Games a stuffed animal is used instead. 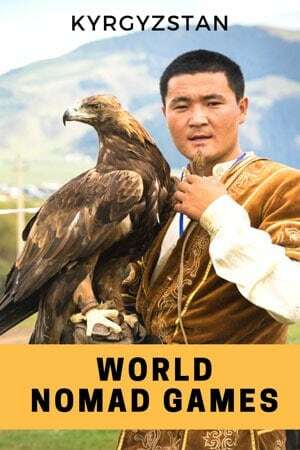 Dalba Oynotuu is falconry, with the owner calling his bird from across a long field. The fastest time for the bird to reach its owner allows the team to be dubbed the winner. Taigan Jarysh is dog racing and hunting, using a breed similar to a greyhound. An eagle returns to its owner in one of the competitions at Kyrchyn Gorge. When Is The Next World Nomad Games? The next World Nomad Games will be held in Kyrgyzstan in 2018, from September 2nd to the 8th. This will continue to be a bi-annual event. After speaking to a few of the organisers there we asked where the 2018 World Nomad Games will be exactly located. While we couldn’t get a definite answer, many felt that the next games may actually move to a different region of the country. Cholpon Ata does have the infrastructure to hold another event, and would be the logical place to hold it, but don’t be surprised if the next one is near Osh or in another regional hub. Yurts line the fields at Kyrchyn Gorge. The first thing to remember is that the World Nomad Games is held in Central Asia, and as such the organisation is logistics may not be perfect. It is still a developing nation and while tourism is on the rise it is not perfect yet. That being said having spoken to people who attended the first one in 2014 as well as the latest one in 2016, the improvements have been immense. Information in English may be hard to find, so utilise the volunteers to help out. Scheduling can change with no notice, so if you are determined to see a particular sport make sure you get there early, and half expect it to be delayed or cancelled. This is due to many different factors and is out of most people’s hands so no point getting frustrated. Patience is a virtue. Food is cheap and plentiful, but of varying quality. Visit the food vendors and restaurants that have the most locals at them. Book your accommodation ahead of time (read our section on where to stay below). Bring a face mask or bandana as it can get dusty with so much action around. A Russian phrasebook will be hugely advantageous in communicating with locals. Local men standing on horses, trying to get a better view. In theory there are public buses running between the venues, and the best people to speak about this are the volunteers. Taxis are also readily available throughout the day. Our biggest tip is to agree on a price before you get inside a taxi. Do expect prices to be slightly higher than you can get in places like Bishkek or Osh, but don’t just settle on a blatant rip-off. If you simply jump in and drive away don’t be surprised if your bill is more than 10x the normal price. If your Russian is pretty good you will probably get a better deal. A great person to talk to is Aigul at Apple Hostel to see if there are any public buses to get around. Try to find better transport than a wooden cart. We stayed at the Kapriz Issyk Kul Resort, arguably the best accommodation in Cholpon Ata. This sprawling resort can host hundreds of guests in their bungalows, villas and comfortable hotel rooms. The villas are spacious with enough room for a family or a group of 6 people. Each one has a kitchen, three bedrooms, three bathrooms, living room and laundry. Wifi is available throughout the property. The best thing about the place is the private beach right on the shore of Issyk Kul. On hot days in summer you can lounge about on beach chairs and swim in the clean (and cold) waters. It is about 6km out of Cholpon Ata so a taxi is needed to get into town, but if you want comfort and seclusion this is the place. Alternatively a great option (and better for backpackers or those wanting a social scene as well) is to stay at Apple Hostel. Run by the affable Aigul, Apple Hostel is the most popular place to stay in the region for anyone on a budget or simply looking to have a good time. Aigul and her staff can organise any tours and activities you want in the area and will steer you in the right direction for food and parties. If you go tell her hello from Alesha and Jarryd! You can even organise yurt stays around Cholpon Ata. The World Nomad Games in Kyrgyzstan was one of the most photogenic and interesting events we have ever had the honour of experiencing. Whether you are a photographer or not you can’t help but be snapping away at the gorgeous scenery, fascinating sports and beautiful people. Here are some of our favourite photos from the 2016 World Nomad Games. Two competitors in Er Enish – horseback wrestling. A Turkish eagle hunter, proud to represent his country at the World Nomad Games. The United States fielded a team in the most famous sport at the games, Kok Boru. Seeing such a foreign team compete was quite a spectacle and was one of the main topics spoken amongst the excited crowd. Despite a lack of experience they put up a valiant effort. Kok Boru is a polo-like sport where the aim of the game is to throw the carcass of a headless goat into two round goals at either end of the field. The goat weighs about 35kg and the strength and skill of the horsemen is tremendous. Kok Boru is also the most controversial sport at the World Nomad Games, with some people believing it is barbaric. However it is a sport that has been played across Central Asia for hundreds of years and is deeply ingrained in their culture. The winning team gets to keep the goat and puts on a big feast after the match, ensuring no part is left to waste. The crowd keenly watches the wrestling. Wrestling is one of the most revered sports in Central Asia, and featured heavily during the World Nomad Games. A young boy performs acrobatics on broken glass in Kyrchyn Gorge. A referee carrying the Kyrgyz flag. Judges carry back targets from the archery competition. A Kyrgyz eagle hunter returns from the field with his bird of prey. Inside a decorative yurt, setup at the cultural ethno village in Kyrchyn Gorge. Ordo is one of the national sports of Kyrgyzstan, and is like bowls or bocci played with knee caps from cows. While it is not exactly a spectator sport, it is a lot of fun to play. Horse racing was held on the last day of competition, and featured young children showing off their skills as opposed to adults. Similar to the Naadam Festival in Mongolia which highlights the horse skills of kids, this brought about a friendly and enjoyable atmosphere. The kids warm up before their race. Proud locals hold their flag in the crowd. The medals getting sorted before the awards ceremony for the final Kok Boru Match. Kyrgyzstan beat Kazakhstan in a thrilling match. The magnificent views over Kyrchyn Gorge, where most of the cultural and eagle sports were held. A lady fries up some food at Kyrchyn. The yurt displays at Kyrchyn Gorge represented the different regions of Kyrgyzstan. Men line up at one of the opening ceremonies in Kyrchyn. Women also competed in the wrestling events at the World Nomad Games. Another angle from the Er Enish. A man on a horse charging in a display of conquerors from previous centuries. Charging with the goat during Kok Boru. The camels of the World Nomad Games. Hi, I am looking to cover the games for our website. Do you know when/where the next ones will be held? Thats great. Sorry we cant help you in the next event. We have heard Turkey but nothing is confirmed. Definitely contact World Nomad Games Official and they may be able to help you. the “last empire” (now big media corporations are convincing people that the actual Russia is the “cause of evil”), some of us, that actually lived the end of the Soviet Union, think that system did not work and neither does the political and economical system in the “poweful” west countries. All we, the common people, do not choose, there is not real democracy as the elites only care for themselves. They act united, we are constantly deceived and kept in a net of lies. Thank you for your comment. This article is about the attending the World Nomad Games. Hi Kelli, there are souvenirs for sale. We highly recommend you exchange your money in Bishkek as everything is in the local currency of som. There is transport between venues for 50 som one way. There are local volunteers there that will help you with this information at the time. Have a great time. Is there available volunteering opportunities for organizing the event and help the foreigners? Hi Bev, we were media when we attended so we went through another gate. They did check our bags very thoroughly even getting us to turn on cameras and look through our lenses. If you bring a small backpack or side bag, I would think that would be fine. They will search it on the way in. Have a great time. we are thinking about attending the World Nomad Games this year and were wondering how far in advance one has to book accommodation and what about tickets for the games? Do you get them on site and then attend whatever sport discipline you want? Can’t find anything about it on the official websites. Looking forward to hearing more insights. Hi Corinne, You will have to book tickets and accommodation. Unfortunately the offical if not well set up for online bookings. Get in touch with Aigul from Apple Hostel and see if she can help you. Sorry we couldn’t help you more. Wow! Each one of these games seems unbelievable, Alesha and Jarryd. I have never attended anything similar to these events so I’m so intrigued to explore Kyrgyzstan. Are these games annual events? Hello dear my brothers. I am extremely happy that our Kyrgyz people celebrating the world nomad games in kyrgyzstan every year. We are as a ethnic Kyrgyz from Pamir (Tajikistan) proud that we have great peopl and great cultures. We live in Tajikistan but our hearts live with you. I personally really want to participate and represent the culture of ethnic Kyrgyzs from Tajikistan. Well done my brothers we are proud of you!!! The best wishes sherali from Pamir Kyrgyz. Ray, in fact, the US team played very well at the Games – some intellectual games like Toguz korgool, it’s something like chess, the performance of Indian dancers accompanied by the US Ambassador to Kyrgyzstan, and the most spectacular was the participation of the US team in Kok boru. They came from Montana and played this game for the first time. The guys said that they will definitely take part in the Games of 2018. They really liked this game. In general Americans liked this Games very much! Thank you so much for fabolous article on World Nomad Games! We hope that you”ll continue writing great articles on WNG 2018. We are ready to share with you our news on WNG 2018! We are inspiring you to come to the WNG 2018! This year is planning to be more magnificant with a lot of sport events, cultural events and scientific events on Nomad. As soon as the official dates of Opening Ceremony of WNG 2018 will be determined we’ll inform everyone on our website. Weclome to the World Nomad Games 2018, Kyrgyzstan! This looks incredible! You know, it’s not often I see a travel blog post that is interesting, new, unusual and not just another 10 things to do in Thailand. This is exceptional and amazing and I’m damn sure I’m going to be at the next games. Fantastic, thanks. The United States participated in the World Nomad Games? I live in Canada and get bombarded with so much sports news related to the United States that this is the first time I am hearing about this! Which nomadic tribes were represented on their team then? Did you happen to catch that information?